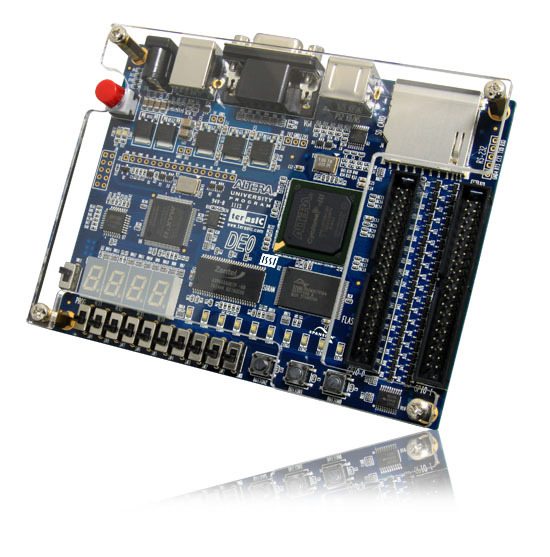 The DE0 Development and Education board is designed in a compact size with all the essential tools for novice users to gain knowledge in areas of digital logic, computer organization and FPGAs. It is equipped with Altera Cyclone III 3C16 FPGA device, which offers 15,408 LEs. The board provides 346 user I/O pins, and is loaded with a rich set of features that makes it suitable to be used for advanced university and college courses, as well as the development of sophisticated digital systems. The DE0 combines the Altera low-power, low-cost, and high performance Cyclone III FPGA to control the various features of the DE0 Board. The DE0 Development Board includes software, reference designs, and accessories required to ensure the user simple access in evaluating their DE0 Board.